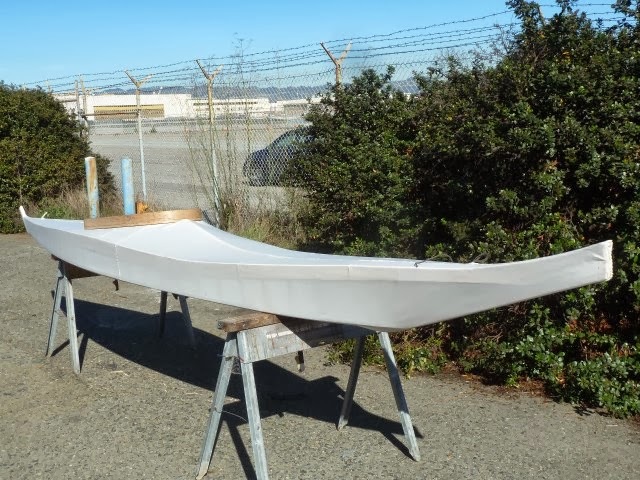 Time to bring the EA kayak building project back to life, on this blog anyway. Time to make some comments on the building experience, a time when the building is done but the boat hasn't been in the water yet and provided feedback on its suitability as a water craft. 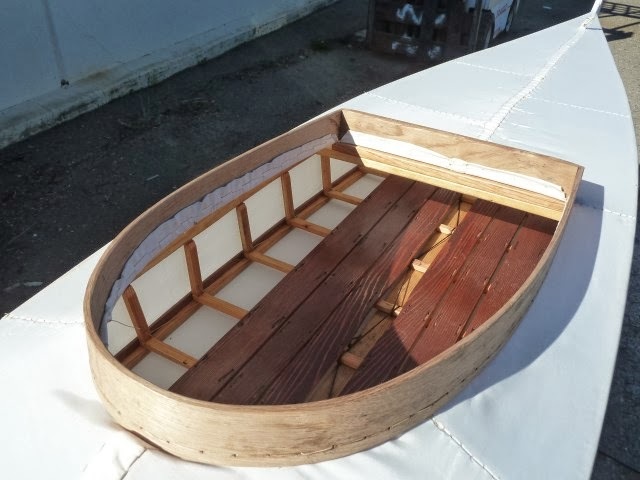 I could have waited another few days to comment on the completion, but I'm thinking that once I try the boat out, I will become preoccupied with how the boat handles and forget all about what I learned from building it. Part of what building an actual boat is all about is internalizing its structure in three dimensions. Plans are flat representations of a boat and typically don't show any more than a top and a side view and some cross sections. But the flow of the form of a boat in three dimensions is a lot more complex than the plans show and to get a feel for the form, you actually have to build the boat. Once you have the feel, you gain the understanding of how that form interacts with the water and determines performance. In any case, if you did some careful reading of the title of this posting, you may have noticed that called it Eastern Arctic-like Kayak. What I mean by that is that when I laid out the shape of the kayak in the horizontal and vertical planes I improvised, that is, I didn't follow a particular plan but rather adapted length and beam to fit the wood that I had available. I came close to building something that could be called Eastern Arctic, but not quite dead on. Let's look at some photos. Here's a picture of the frame just before the skin went on. If you let your eye follow the right gunwale line you will notice that it has some bumps in it. I think in general EA kayaks had a smoother sheer line. Here's a shot of the boat frame. Bow down. As you can see, the plan view is more like a Greenland hull than an Eastern Arctic. Part of the problem with working by eye in a tight space. Should have dragged the frame outside at deck setup time for a better view and probably would have noticed that the back end should have been wider. I suspect the boat will behave ok, just with a narrower stern won't have as much carrying capacity. And anybody who knows anything will feel compelled to tell me that I didn't make the back wide enough. Yeah, I know. View from the side with the skin on. The nose is unorthodox, a little taller than traditional. 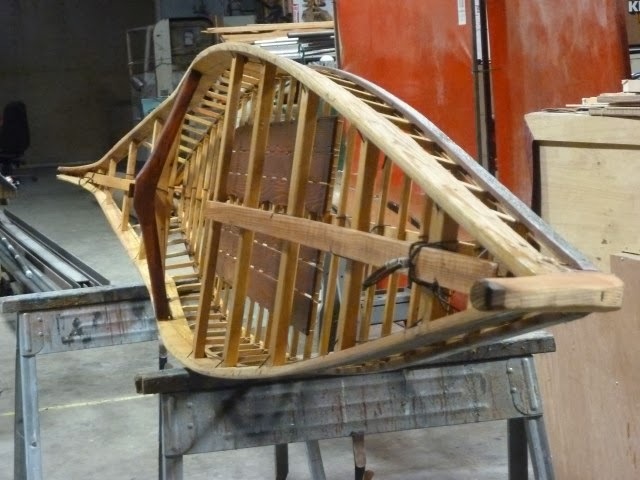 Looks more like a northwest pacific canoe bow. Also the sheer line is a tad extreme. We'll see how that works out. Meanwhile, the cockpit turned out more or less standard, maybe a few inches longer than traditional. Soon this boat will have some paint and then hit the water. Till then I'm holding off on any predictions re performance. I am most curious to see how the flat bottom will feel and how much stability vs. speed tradeoff there is in such a flat bottom. Stay tuned. Thanks for the link Udo. My version turned out to be just short of 18' long. I didn't want anything longer than that. 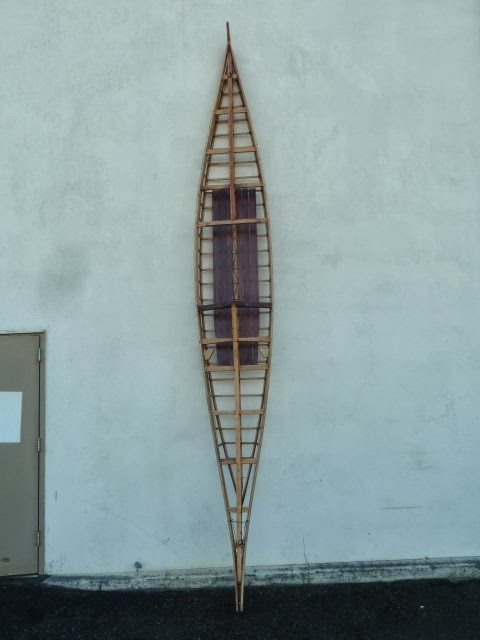 Supposedly people made these kayaks up to 21' long. Transporting a boat that long is difficult. Also they weigh quite a bit more than other kayaks. I haven't weighed mine yet but it is near the upper limit of what I can lift up on top of a car.